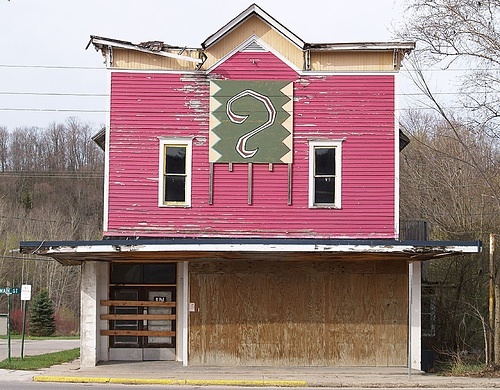 The image we use from Flickr to illustrate this page is symbolic in that the photographer entitles it “Question Mark on Hobson’s Old Building, Corner of Henry & Main (Honor, MI) and then in much smaller writing underneath observes “at least, I think that’s a question mark”. Sometimes we are clear about the questions in our heads, sometimes they take a while to form, or we do not realise that a question is emerging as we think. We supplement our case studies in Chapter 8 with two additional articles on object analysis. These can both be viewed from the point of view of how we deepen our reflection on, and understanding of, the symbolic value of everyday artefacts (in Artefacts and the Everyday) and also in terms of the questioning method used to unpack this reflection and understanding. The second, Barbies, Bras, Sneakers & Object Analysis offers a short activity which uses Prown and Steele’s models of material culture methodology, breaking the questions into three discrete sections.